Earlier this month the USB Implementers Forum announced the new USB Power Delivery 2.0 specification. Long awaited, the Power Deliver 2.0 specification defined new standards for power delivery to allow Type-C USB ports to supply devices with much greater amounts of power than the previous standard allowed, now up to 5A at 5V, 12V, and 20V, for a maximum power delivery of 100W. 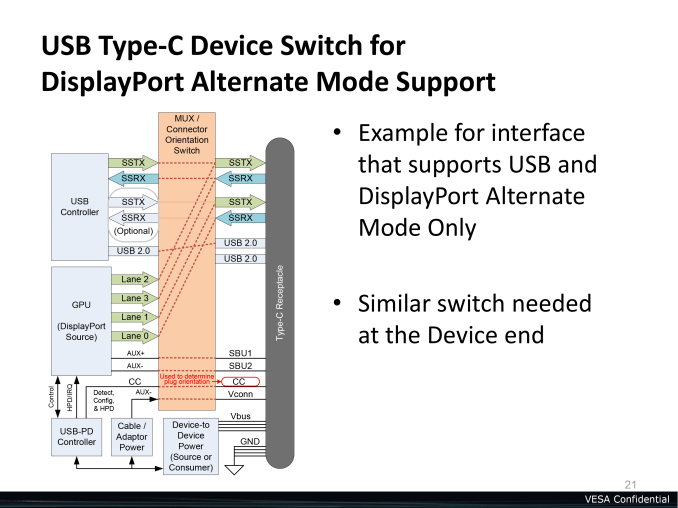 However also buried in that specification was an interesting, if cryptic announcement regarding USB Alternate Modes, which would allow for different (non-USB) signals to be carried over USB Type-C connector. 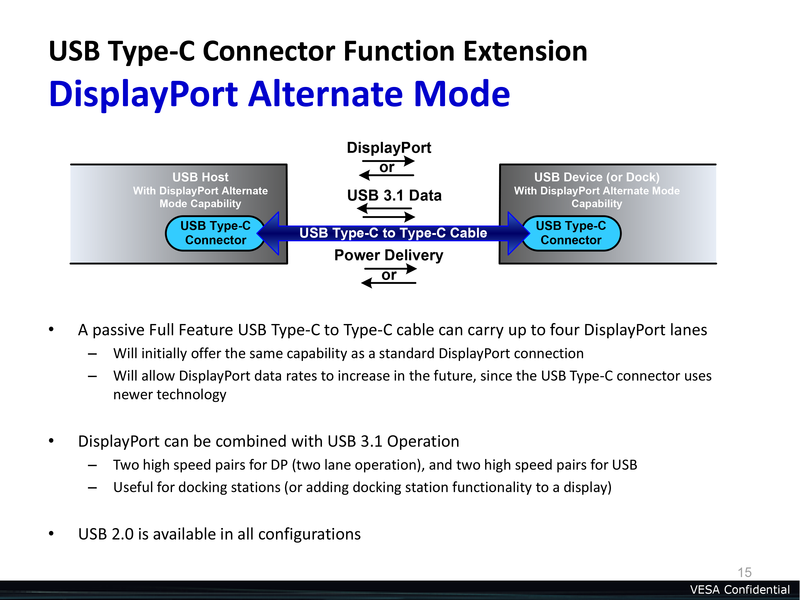 At the time the specification simply theorized just what protocols could be carried over Type-C as an alternate mode, but today we finally know what the first alternate mode will be: DisplayPort. 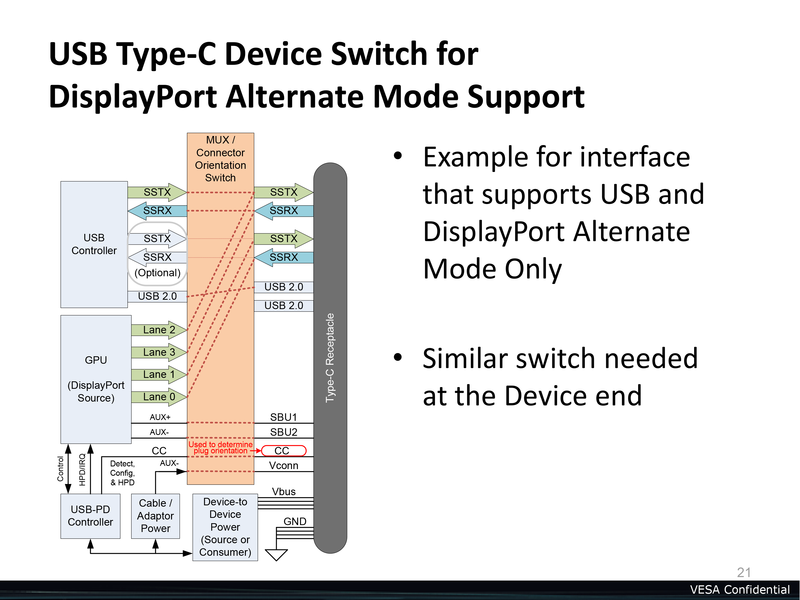 Today the VESA is announcing that they are publishing the “DisplayPort Alternate Mode on USB Type-C Connector Standard.” Working in conjunction with the USB-IF, the DP Alt Mode standard will allow standard USB Type-C connectors and cables to carry native DisplayPort signals. This is designed to open up a number of possibilities for connecting monitors, computers, docking stations, and other devices with DisplayPort video while also leveraging USB’s other data and power capabilities. 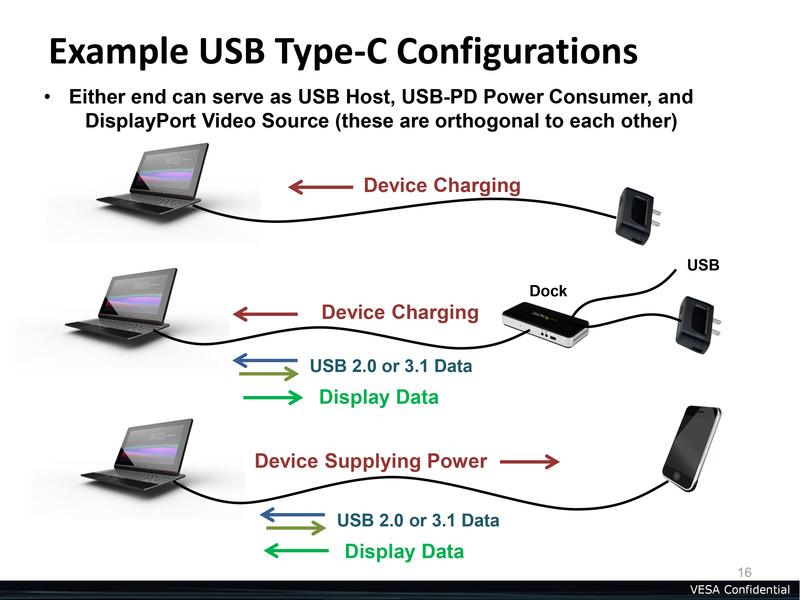 With USB 3.1 and Type-C the USB-IF was looking to create a single cable that could carry everything, and now that DisplayPort can be muxed over Type-C, USB is one step closer to that with the ability to carry native video. From a technical level the DP Alt Mode specification is actually rather simple. 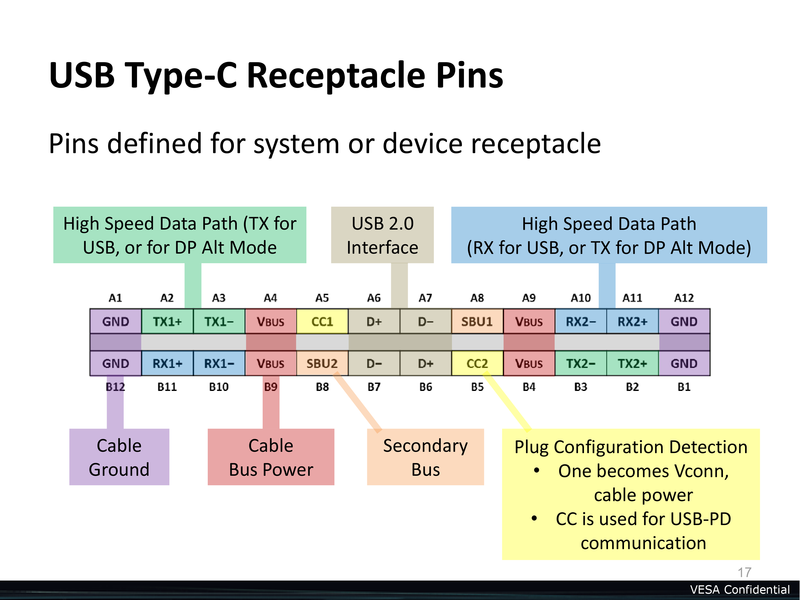 USB Type-C – which immediately implies using/supporting USB 3.1 signaling – uses 4 lanes (pairs) of differential signaling for USB Superspeed data, which are split up in a 2-up/2-down configuration for full duplex communication. Through the Alt Mode specification, DP Alt Mode will then in turn be allowed to take over some of these lanes – one, two, or all four – and run DisplayPort signaling over them in place of USB Superspeed signaling. 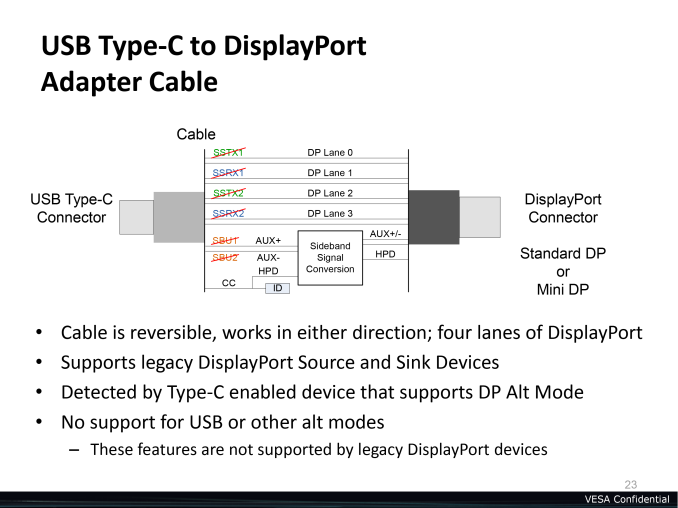 By doing so a Type-C cable is then able to carry native DisplayPort video alongside its other signals, and from a hardware standpoint this is little different than a native DisplayPort connector/cable pair. From a hardware perspective this will be a simple mux. USB alternate modes do not encapsulate other protocols (ala Thunderbolt) but instead allocate lanes to those other signals as necessary, with muxes at either end handling the switching to determine what signals are on what lanes and where they need to come from or go. Internally USB handles this matter via the CC sense pins, which are responsible for determining cable orientation. Alongside determining orientation, these pins will also transmit a Standard IDentification (SID), which will be how devices negotiate which signals are supported and which signals to use. After negotiation, the devices at either end can then configure themselves to the appropriate number of lanes and pin orientation. Along with utilizing USB lanes for DP lanes, the DP Alt Mode standard also includes provisions for reconfiguring the Type-C secondary bus (SBU) to carry the DisplayPort AUX channel. This half-duplex channel is normally used by DisplayPort devices to carry additional non-video data such as audio, EDID, HDCP, touchscreen data, MST topology data, and more. Somewhat perversely in this case, the AUX channel has even been used to carry USB data, which dutifully enough would still be supported here for backwards compatibility purposes. Since the main DisplayPort lanes and AUX channel can be carried over Type-C, when utilized in this fashion Type-C is very close to becoming a superset of DisplayPort. 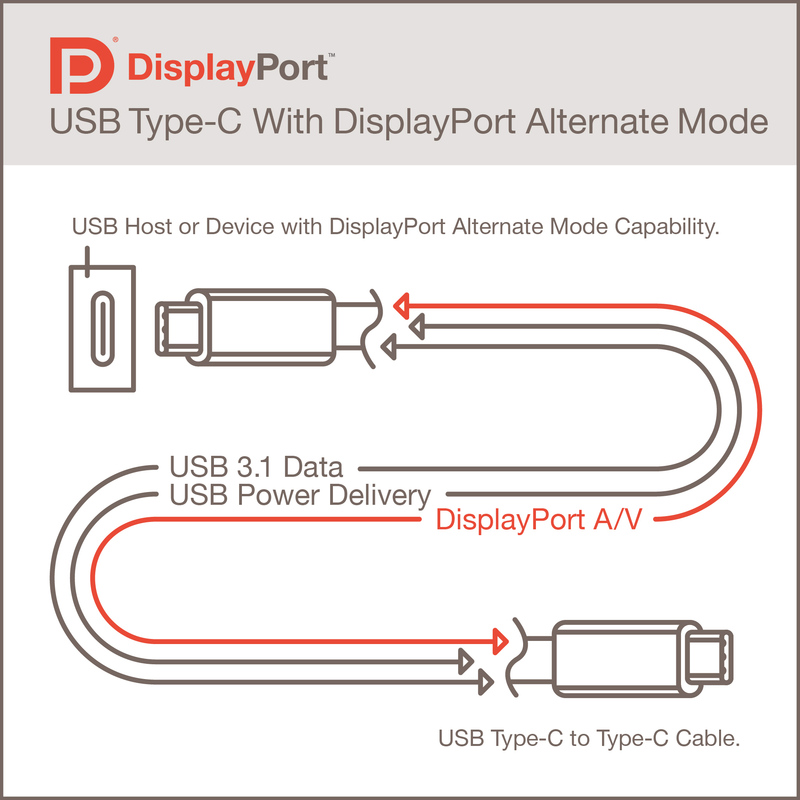 In a full (4 lane) DisplayPort configuration, along with all of the regular DisplayPort features a Type-C cable also carries the standard USB 2.0 interface and USB power, which always coexist alongside alt mode. 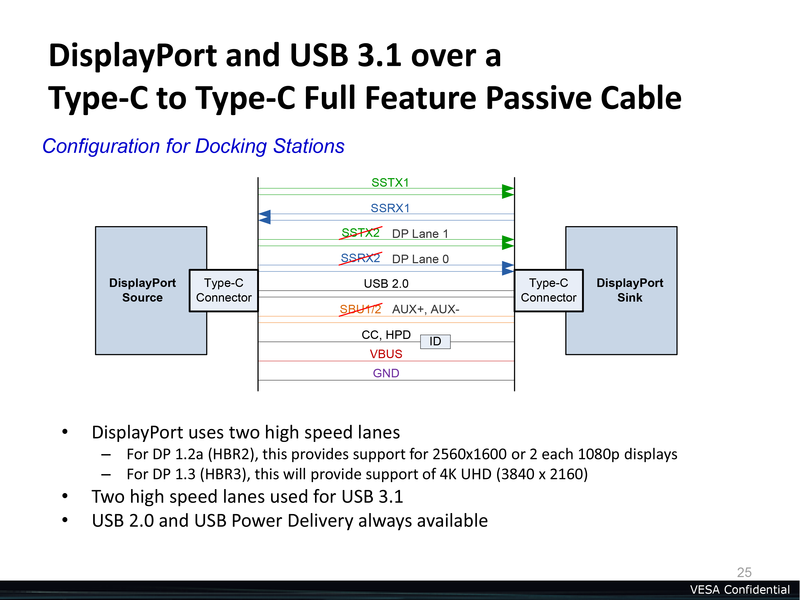 So even in these configurations Type-C allows dedicated high power and USB 2.0 functionality, something the DisplayPort physical layer itself is not capable of. And of course when using a less-than-full configuration, 2-3 of those lanes on the Type-C cable then can be left to running USB Superspeed signaling, allowing USB 3.1 data to be carried alongside the narrower DisplayPort signal. Meanwhile since DP Alt Mode means that Type-C carries native DisplayPort signaling, this enables several different interoperability options with other Type-C devices and legacy DisplayPort devices. On the hardware side Type-C ports can be used for the sink (displays) as well as the source (computers), so one could have a display connected to a source entirely over Type-C. Otherwise simple Type-C to DisplayPort cables can be constructed which from the perspective of a DisplayPort sink would be identical to a real DisplayPort cable, with the cable wired to expose just the DisplayPort signals to the sink. Or since these cables will be bidirectional, a legacy DisplayPort source could be connected to a Type-C sink just as well. This also means that since DP Alt Mode is such a complete implementation of DisplayPort, that DisplayPort conversion devices will work as well. 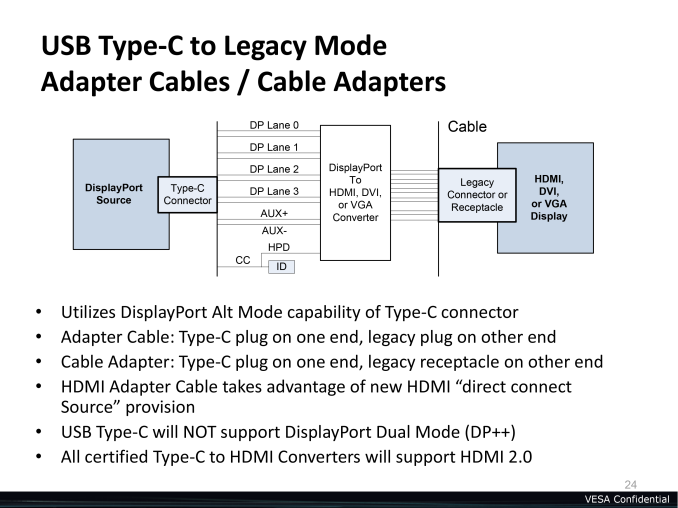 DisplayPort to VGA, DVI, and even HDMI 2.0 adapters will all work at the end of Type-C connection, and the VESA will be strongly encouraging cable makers to develop Type-C to HDMI 2.0 cables (and only HDMI 2.0, no 1.4) to make Type-C ports usable with HDMI devices. In fact the only major DisplayPort feature that won’t work over a Type-C connector is Dual-Mode DisplayPort (aka DP++), which is responsible for enabling passive DisplayPort adapters. So while adapters work over Type-C, all of them will need to be active adapters. Because of the flexibility offered through the DP Alt Mode, the VESA and USB-IF have a wide range of options and ideas for how to make use of this functionality, with these ideas ultimately converging on a USB/DisplayPort ecosystem. With the ability to carry video data over USB, this allows for devices that make use of both in a fashion similar to Thunderbolt or DockPort, but with the greater advantage of the closer cooperation of the USB-IF and the superior Type-C physical layer. At its most basic level, DP Alt Mode means that device manufacturers would no longer need to put dedicated display ports (whether DisplayPort, VGA, or HDMI) on their devices, and could instead fill out their devices entirely with USB ports for all digital I/O. This would be a massive boon to Ultrabooks and tablets, where the former only has a limited amount of space for ports and the latter frequently only has one port at all. To that end there will even be a forthcoming identification mark (similar to DP++) that will be used to identify Type-C ports that are DP Alt Mode capable, to help consumers identify which ports they can plug their displays into. The MUX concept is rather simple for hardware but I do get the impression that devices with multiple Type-C ports will only enable it on a fraction of their ports, hence the need for a logo for consumers to identify these ports. But we’ll have to see what shipping devices are like. More broadly, this could be used to enable single-cable connectivity for laptops and tablets, with a single Type-C cable providing power to the laptop/tablet while also carrying input, audio, video, additional USB data, and more. This would be very similar to the Thunderbolt Display concept, except Type-C would be able to be a true single cable solution since it can carry the high-wattage power that Thunderbolt can’t. And since Type-C can carry DisplayPort 1.3 HBR3, this means that even when driving a 4K@60Hz display there will still be 2 lanes of USB Superspeed+ available for any devices attached to the display. More likely though we’ll see this concept first rolled out in dock form, with a single dock device connecting to an external monitor and otherwise serving as the power/data hub for the entire setup. Speaking of which, this does mean that USB via DP Alt Mode will more directly be competing with other standards such as Thunderbolt at DockPort. Thunderbolt development will of course be an ongoing project for Intel, however for DockPort this is basically the end of the road. The standard, originally developed by AMD and TI before being adopted by the VESA, will continue on as-is and will continue to be supported over the DisplayPort physical layer as before. 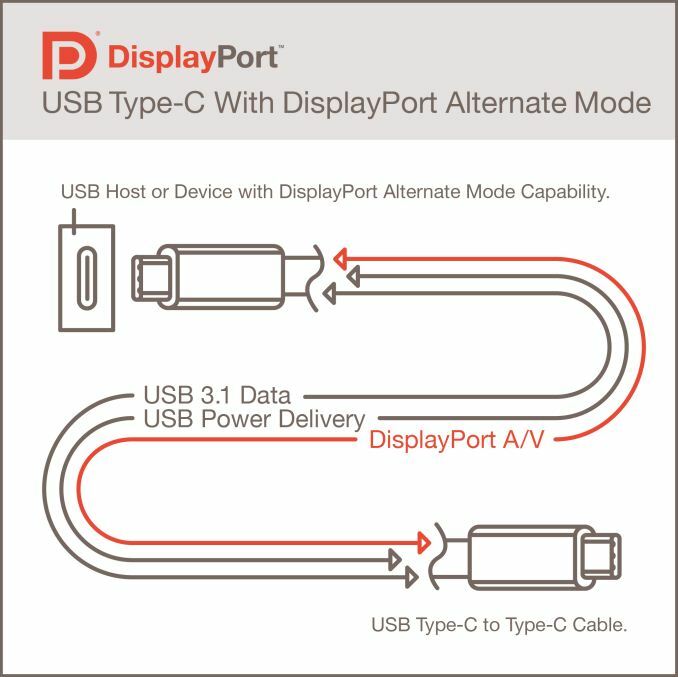 However it’s clear from today’s announcement that DisplayPort over USB has beaten USB over DisplayPort as the preferred multi-signal cabling solution, leaving DockPort with a limited duration on the market. It’s interesting to note though that part of the reason DP Alt Mode is happening – and why it’s going to surpass DockPort – is because of the Type-C physical layer. 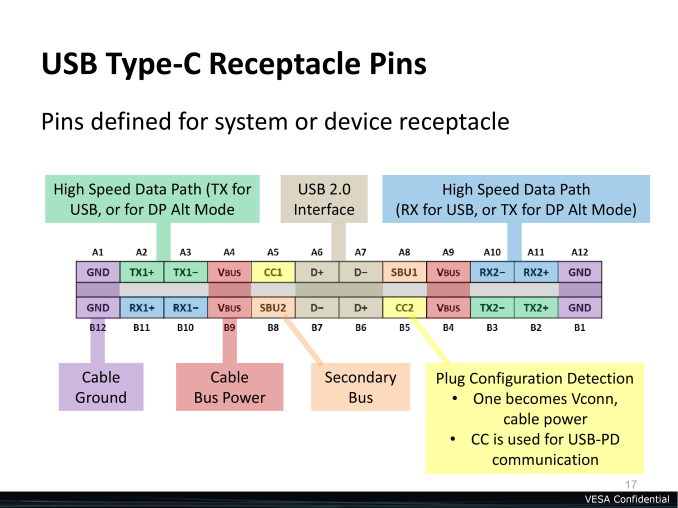 In designing the Type-C connector and cabling, the USB-IF has specific intentions of having the Type-C connector live for a decade or more, just like USB Type-A/B before it. That means they’ve done quite a bit of work to future-proof the connector, including plenty of pins with an eye on supporting speeds greater than 10Gbps in the future. For that reason the possibility is on the table of ditching the DisplayPort physical layer entirely and relying solely on Type-C. Now to be clear this is just an option the technology enables, but for a number of reasons it would be an attractive option for the VESA. As it stands the DisplayPort physical layer tops out at 8.1Gbps per lane for HBR3, meanwhile Superspeed+ over Type-C tops out at 10Gbps per lane with the design goal of further bandwidth increases. As the complexity and development costs of higher external buses goes up, one could very well see the day where DisplayPort was merely the protocol and signaling standard for monitors while Type-C was the physical layer, especially since DisplayPort and USB Superspeed are so very similar in the first place due to both using 4 lanes of differential signaling. But this is a more distant possibility; for now the DP Alt Mode ecosystem needs to take off for the kinds of mobile devices it’s designed for, and only then would anyone be thinking about replacing the DisplayPort physical layer entirely. Wrapping things up, the VESA tells us that they are going to hit the ground running on DP Alt Mode and are seeing quite a bit of excitement from manufacturers. The VESA is expecting the first DP Alt Mode capable devices to appear in 2015, which is the same year Type-C ports begin appearing on devices as well. So if everything goes according to schedule, we should see the first DP Alt Mode devices in just over a year. The all-in-one cable concept has been a long time coming, and after DockPort and Thunderbolt stumbling the market does look ripe for DP Alt Mode. So long as the execution is there, the manufacturers are willing to use it, and device compatibility lives up to the promises. Getting video over USB is the ultimate Trojan horse – unlike mDP, USB is already everywhere and will continue to be – so this may very well be the X factor needed to see widespread adoption where other standards have struggled. Now THAT'S a universal bus. Seriously though - this looks pretty cool. Even beyond the different daisy chaining configurations it will be nice to just have one cable to hook stuff together if this works out. Need to connect your printer, scanner, mobile device, monitor - use this cable. Need to charge your whatever - use this cable. Cable gone bad and giving you a bad day? It's OK because all the other cables you have are the same kind of cable. Just use one of them. I wish I could upvote you, because I would upvote you so hard. It also couldn't handle power transfer... THIS is what the mobile industry has needed for years and what will possibly mark the return of the dock model and laptops/mobile more frequently devices connected to full size/peripherals and displays at home. There is absolutely a demand for this, it just hasn't been very easy (the average consumer looking at a power cable, USB hub, display cable, etc just gives up). I know Mac users young and old that bought iMacs even tho they had MBP already because they wanted something larger at home.